You'll want to live in this cozy hoodie. 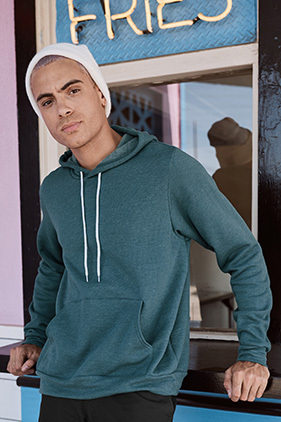 52% Airlume combed and ring-spun cotton/40% poly fleece, 30 single 7 ounce soft sponge fleece hoodie. Markedly soft, unisex with a loose versatile look and fit. Sideseamed. Retail fit. Unisex sizing. White cord drawstring. Kangaroo pockets. Ribbed cuffs and waistband. Ath. Heather: 90% combed and ring-spun cotton/10% polyester. Marble fleece: 85% Airlume combed and ring-spun cotton/15% polyester. Heather Navy: 60% Airlume combed and ring-spun cotton/40% poly fleece.